For the first time in over 30 years during my frequent visits to Puttaparthi, I was asked this question by a stranger. I was taken aback because this is a very unusual occurrence for me in Puttaparthi. My parents and I were about to sit down for dinner when the stranger walked over to us. "I am Rakesh Menon, your husband's friend from Class 1,'' he said. Phew! Of course, I have heard about Rakesh Menon from my husband though the two friends have not met each other for over two decades. ''Heard so much about you and now I finally got to meet you....the year was 1997. Sanand couldn't stop talking about you and I have heard so much about your romance...,'' Rakesh was smiling as he said this. I was literally squirming - it does feel a little odd to hear about my romance in front of my parents and my very curious 11-year-old son. But Rakesh Menon has this amazing way of making everyone feel at ease, especially my son. ''I lost my mother at a young age, my uncle brought me to Puttaparthi to see Swami. From then, Swami ''adopted'' me, told me that He will be ''mother'' and He kept His word. His love and protectiveness towards all of us - his students - was that of a mother, but perhaps more than a mother. He could not bear any of us fall sick or get hurt. 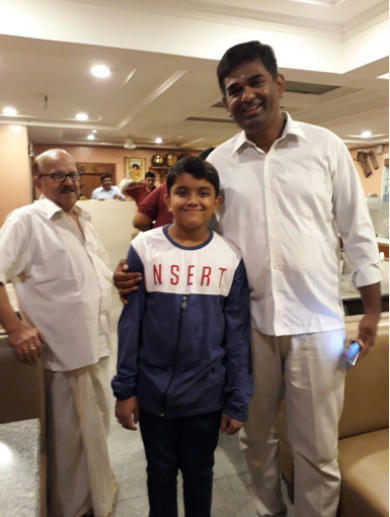 He knew every little thought in our minds, particularly mine and every day he would ask how many idlis I had or what I ate for breakfast, he was parent and Guru for us,'' a smiling Rakesh showed us many personal photographs from his students days with Swami. Adi was wonder struck by the personal photographs and asked many questions, which Rakesh patiently answered. ''I am from Kochi but for me, Puttaparthi is my home. Our life is simple here, so are we. The joy of being able to make a positive difference in the lives of many people cannot be described,'' Rakesh told us. Rakesh Menon was Senior Vice President of JP Morgan Europe, and later, he worked as Senior Vice President and Controller, Credit Suisse Asia Pacific. Prior to this, he had worked with Citigroup, the Middle East and Standard Chartered Bank, Dubai. That he left a successful corporate career in London to embrace a life of simple living in Puttaparthi is inspiring. It is not an easy choice. The fact that Rakesh and his family are happy in Puttaparthi speaks volumes about the ''correctness'' of the unconventional choice he made. "Write like you used to, make it your Seva," Rakesh reminded. You know that scene in Ustad Hotel, where Dulquer Salman gives up a great opportunity to shine as a chef abroad after he has the experience of cooking for children who are differently abled? That moment when he knows what he wants to do to create meaning in his life and that of others. Plug back into your divine self. Contribute to the society's less fortunate. Do Seva. Write about the good stuff. Be happy. Embrace a simple life. Simple stuff. But that's what life is about - the simple stuff. We forget it. What do you feel is the best thing about the choices you have made in your life's journey and how does it plug back into your happiness quotient?